This new model of a female pelvis with pelvic floor musculature represents the pelvic floor in its layers. 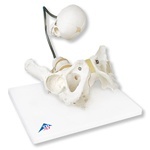 This life size flexible female pelvis model is made of high quality flexible plastic to allow for the demonstration of various types of pelvic malformations. Female Pelvis Anatomy Model Cross-section A one-half scale mid-sagittal cross-section of the pelvis Pelvic Skeleton, male Consisting of hip bone, sacrum with coccyx and 2 lumbar vertebrae. through the pelvis during birth.